NAPLES, FL (July 17, 2018) - The Naples Area Board of REALTORS® (NABOR®) launched its newly designed public website - www.NAPLESAREA.com complete with many impressive new features. This stunning website showcases over 10,000 listings that include single family homes and condominiums for sale in the Naples area. It provides a rewarding experience for both homebuyers and sellers by offering quick search results and easy access to Naples area REALTORS®, community resources and real estate market statistics. The fresh, modern, responsive design features robust content that focuses on NABOR®'s mission to provide home buyers the valuable information they need to find their dream home in paradise. The newly designed site offers an engaging website experience that is fast-loading and mobile ready for users who want to search for properties on the go. Combining the latest mapping technology with an easy-to-use design, searching for properties in a designated area is easier than ever. Most importantly, the site is dedicated to keeping listing information current. The Matrix MLS (multiple listing system) is the exclusive source of the property data which updates every fifteen minutes to maintain the accuracy of property information. Additionally, the site creates the opportunity for homebuyers and sellers to connect with local REALTORS® who are experts in Naples area properties, communities, schools and resources. Website visitors can quickly search for waterfront, golf course or rental properties as well as open houses, specific communities and commercial properties. 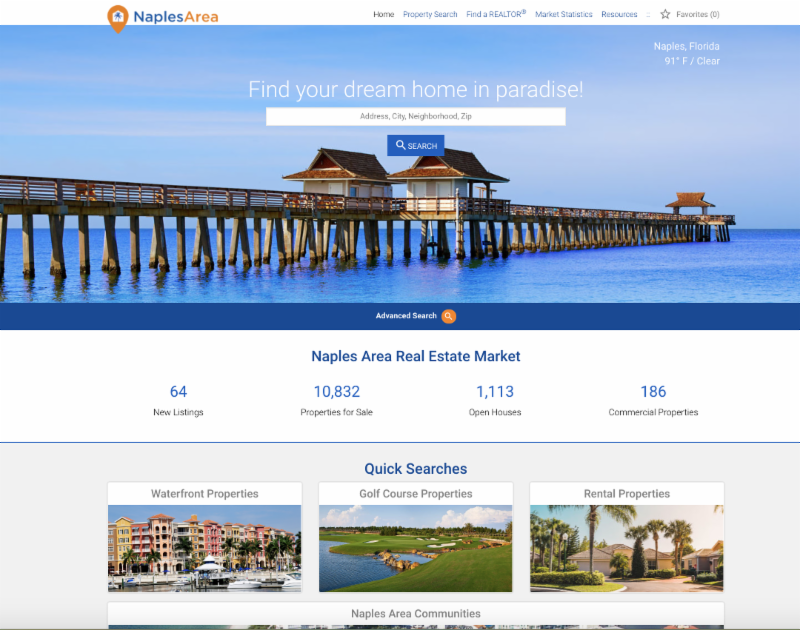 "The newly designed NaplesArea.com website represents a significant step in our commitment to help members reach those homebuyers and sellers who can benefit from the professional services our members offer," said Rick Baranski, President of Naples Area Board of REALTORS®. NAPLESAREA.com serves as the most accurate, mobile-friendly and consumer-friendly website that provides the most comprehensive Naples-area real estate information to help home buyers and sellers with their real estate needs. We suggest you explore our newly designed website for yourself to see all the features and benefits. Visit us now at www.NaplesArea.com and experience the best website for searching Naples area properties for sale and rent.